Aim to be a HERO! 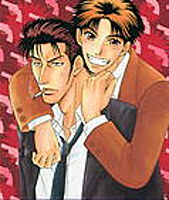 Plot Summary: Toranosuke Kashima (Tora-san) is a new detective who has always dreamed of being one. He was partnered with horse-faced Koudai Mahori (Dai-san) who used to work in the main headquarters but decided to go back to work in the precinct. One day Dai-san stole a kiss from Tora-san but Tora-san knew that something deeper was occuring with Dai-san and their boss Kanrikan Sagara. This love triangle story is full of action and comedy.